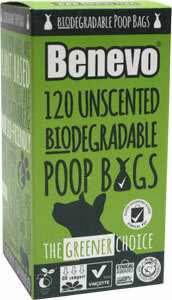 The greener choice for dog waste disposal, these plant-based poop bags are sustainable, eco-friendly, and are compostable, making them the smart choice compared to plastics! Each box contains 8 handy individual rolls with 15 bags per roll, giving you 120 total bags per package. $5.99 per box.